The Mauritius Parakeet (Psittacula echo) - also known as Echo Parakeet - is the sole survivor of the Psittacula species which inhabited the Southern Indian ocean islands near Madagascar. It is among the rarest extant psittacids in the world. It is endemic to Mauritius in the Mascarene Islands, and formerly might have been found on Réunion as well. In the 1980s, there were only about 10 left alive. But, in a rare success story, a two-decade conservation program in a wooded corner of Mauritius has brought the Echo Parakeet back from the brink of extinction. But careful breeding, supplementary feeding and the protection of nests have boosted numbers in the wild to more than 320 birds. Please refer to this article for more details on these recovery efforts. Its scientific name is possibly Psittacula eques echo because a similar bird was reported to have existed on nearby Réunion and could be considered the nominate subspecies of the extant Mauritius parakeet as it was described earlier (BirdLife International, 2006). They average 16.5 inches (42 cm) in length. The plumage is mostly green. The back of the head to the side of cheek area is suffused with blue. There is a broad cheek-stripe to the side of nape and a narrow line from the cere to eye. The collar to the side of the nape is pink. The abdomen and under wing-coverts are a slightly brighter green. The upperside of the tail-feathers are green and the underside dirty yellow. The upper beak is red and the lower lower is black. The irises are yellowish and the feet grey. Females have a dark green stripe to cheek and they don't have the pink band to the nape. They have a yellow-green collar and lack the blue tinge to back of head. The middle tail-feathers are washed with blue. Their black beak distinguishes them easily from the male that have a red beak. Immatures look like females, but have shorter tail-feathers. The island of Mauritius, lying in the western Indian Ocean to the east of Madagascar, is home to some of the most endangered birds in the world. There are nine endemic species, all of which are in tiny populations, some at critical risk of extinction. Many others like the Dodo are long gone. The causes of these severe conservation problems are varied, but include introduced predators, habitat degradation and destruction and heavy pesticide use during the 1960s, all familiar factors on many other isolated islands. Since the early 1970s, ornithologists have recognised the dangers to Mascarene birds and have struggled to pull them back from the brink. Efforts were, and still are, limited by funding and the early work begun by Stanley Temple very much concentrated on the Mauritius kestrel (Falco punctatus), which is now an internationally famous success story. From there, Carl Jones and his team have progressed to the Pink pigeon (Nesoenas mayeri) and, since 1987, have been doing year round work on the Echo parakeet (Psittacula eques). 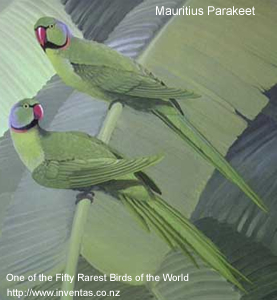 The genus Psittacula includes some dozen species of medium-sized green parakeets whose distribution rings the Indian Ocean, from Africa round to the Malay peninsula. The Echo parakeet is the last surviving member of the genus on the islands of the western Indian Ocean; other species or subspecies existed on the Seychelles and the other Mascarene islands, Rodrigues and Reunion, but are all now extinct. The Echo appears to be a strictly arboreal forager, nesting in natural cavities in native trees, and differs from the Rose-ringed parakeet (Psittacula krameri) in its larger and bulkier body shape, shorter wings and tail, and more raucous call. Reasons for the decline of the Echo are not entirely clear. It was reasonably common in the 19th century, but in the latter part of this century the population declined to about 40 birds by the time rescue work began in the early 1970s, and even further to an estimated 8 to 12 individuals with only 3 females by 1986. Certainly, as with all Mauritian species, habitat loss both from destruction and degradation has been severe. Although there are still reasonable areas of native forest remaining on the higher ground (much of the rest being given over to sugar plantations), much of this is heavily invaded by introduced plants like guava. Consequently production of native fruits and regeneration of potential nest trees is very poor, and the birds suffer from a shortage of food and nest sites. Among introduced predators it is the arboreal species including crab-eating macaques (Macaca fascicularis) and black rats (Rattus rattus) which affect the parakeet, both by raiding nests and competing for native fruits. Pesticides, which certainly brought the Mauritius kestrel close to extinction, do not seem to have played a significant part in the parakeet's decline. The significance of a thriving population of introduced Rose-ringed parakeets is unclear; they do not appear to compete directly with the Echos but may present a considerable disease risk. During the 1970s, the Echo received least attention amongst the native birds, simply because dedicated funding and personnel wre not available. Nestboxes were put up in the forest but were never used, and several birds were taken into captivity but none survived to breed. Only since the late 1980s, when the kestrel has been effectively saved and the pigeon is well on its way, has more money and effort been directed towards the Echo. Stanley Temple coined the term "clinical ornithology" to describe the type of intensive conservation management of wild birds which began with attempts to save falcon populations in North America. A combination of nest site protection and reconstruction, habitat restoration, supplementary feeding, pest control and manipulation of breeding biology has been applied to a number of critically endangered birds across the world, but probably developed to its highest level in Mauritius and New Zealand. Increasingly, in situ captive breeding has become an integral part of these manipulations, both to supplement and insure wild populations. The very close integration of wild and captive birds which is involved in these programmes has been described by Carl Jones as "captive breeding in the wild". Habitat management for the Echo is particularly directed at increasing the productivity of native forest, which benefits all endemic species of both plant and animal. The foundation of a major national park of about 4000 hectares of the best surviving forest is a major part of this, but equally important is the direct management of scattered plots of degraded forest by literally weeding out the pest species, often by hand. The response of the forest to this work is remarkably rapid, and Echos and other species are to be found feeding in these managed plots within one or two years. The response in terms of tree regeneration is obviously going to be much more long term, so that some effort to supply artificial nest sites in the meantime will be necessary, especially as the population of parakeets recovers. Supplementary feeding has been very effective in helping support the restored kestrel populations to rear full clutches, and is easily applied to the Pink pigeon which takes to bird tables with alacrity. Seasonal food shortages certainly limit the Echos' ability to rear chicks, but efforts to get the birds to take supplementary foods have not been very successful. It is hoped that the release of trained captive birds will help to attract the wild birds to feed, and perhaps introduce them to non-native fruits. A number of known Echo nesting sites have been destroyed by cyclones or have collapsed, and more than one has been successfully restored by field workers. Nestbox provision has not yet been successful, although a number of boxes are now in place where existing holes have been lost. Mynah birds are the main competing species for nest holes. Predator reduction around nest sites is extremely important. Rats are poisoned extensively up to 200m around nest trees and the success of this operation is monitored by trapping. Expertise imported from New Zealand has been particularly valuable in this area. Feral domestic cats are also ruthlessly exterminated by field workers, but the mongoose (Herpestes auropunctatus) and the monkeys are not such a direct threat. Close observation and constant monitoring of every nest throughout the breeding season probably helps to keep these other predators away. Aviculture Echo parakeets have been kept at the Black River aviaries, sited on the coast, since the early years although with little success until recently. Up to 1993 20 birds had been kept for the purposes of captive breeding, which derived from 10 chicks and 12 eggs harvested from wild nests, plus one wild caught adult, yet only 3 remained alive by late 1993. The majority had come into captivity and been foster reared under a captive group of Rose-ringed parakeets since 1987. These birds have proved very successful at hatching and rearing Echos, but 12 of the 15 birds reared during the 1987-93 period had died at 4 to 18 months of age. Previous investigations of causes of death had been inconclusive, but had tended to attribute the considerable fat stores found in Echos to incorrect feeding, leading to an acute change in the diet to very low fat, low protein vegetables and fruit. This was almost certainly a mistake and it is clear that microorganisms which we would now recognise as major problems in parrots were ignored. Investigation of deaths occurring in 1993 showed that they were mainly due to Gram negative infections which could be traced to hygiene problems, particularly with the water supply. Analysis showed that most of the previous deaths had occurred in the April cyclone season (Echos breed late in the year between September and December), when even the mains water supply can become heavily contaminated. Investigation of the problem was approached in exactly the same way as an avicultural site visit, and appeared to pay dividends, as rearing has been very successful since then. The captive aviary population is currently 18 birds, with successful breeding from one pair. The old aviary site, where remarkable work has been done under fairly primitive conditions, is now being replaced with a purpose built compound which, when completed this spring, will house up to 12 breeding pairs of Echos and have a large 60m flight cage for juvenile birds. Echos are still being reared under ringnecks, although there was s severe scare in 1993 when several of the foster birds and their own offspring proved serologically positive for polyomavirus. As there was no clear evidence of disease resulting from this infection (archive Echo tissues were submitted to DNA probe investigation with negative results) and the population was at a critical stage, it was decided to continue despite the risk, and subsequent testing has found all the ringnecks and Echos to be seronegative. Psittacine beak and feather disease testing has also proved consistently negative. This year there has been more emphasis on handrearing Echos using puppets, with the aim of developing a tame flock for early release. As well as regular disease monitoring and screening of the captive population, considerable effort is being put into the wild birds. Parasites and diseases that have been known to be a problem in the past have been tackled in various ways, one example being the addition of 5% carbaryl dust to nest material in wild nests to prevent tropical nest fly attack, and another the trial of an antifungal treatment of the substrate to prevent aspergillosis. Every known nest is monitored daily by the field teams, who weigh every wild chick every day until fledging and pull chicks if there is the slightest sign of weight loss or growth check. This monitoring also allows their health to be checked, and every accessible wild chick has been blood sampled for PBFD. The expertise of the field workers even extends to trapping the adults on the nests, which are systematically being sampled and tested for blood parasites, PBFD, polyoma, herpes and paramyxoviruses, as well as for DNA fingerprinting. Faecal samples are also collected opportunistically. Fortunately, like many island birds, the Echo parakeet is a very tame and forgiving bird, and the adults seem to support all this interference very phlegmatically. There have been no instances of nest desertion attributable to manipulation. It is hoped to extend disease monitoring to the feral ringnecks as well, when manpower is available to catch them. They may represent a potential disease reservoir should the Echo population increase sufficiently to come into closer contact with them, and there have been reports of ringnecks with feather abnormalities in the wild. The future The Echo parakeet population now stands at about 40 to 50 birds in total, with seven known wild breeding pairs and some other possibles. There is still a preponderance of males but fortunately there are some surplus captive females. During 1995, a trial release of hand tame ringnecks was carried out in one area of the forest, with a view to attempting the same with handreared Echos, possibly as early as this autumn. The urgency is to try to augment the wild males with females and also to use the tame birds as a lure to attract and teach the wild flock to use supplementary feed and artificial nest sites. Radiotracking and other standard ornithologival techniques will be used to monitor their progress. A combination of outstanding conservation fieldwork with standard avicultural and veterinary techniques has served to haul the diminutive Echo parakeet back from the brink of extinction. There is clearly a long way to go, with many pitfalls which are only all too familiar to aviculturists, but we can reasonably hope that, with the continuing support of the parrot community, the Echo will join the kestrel and the Pink pigeon as another of Mauritius' astounding conservation success stories.